An essay by Jun Mitsui and three projects were published in KINDAIKENCHIKU Magazine for March 2016. – Jun Mitsui & Associates Inc. Architects｜Pelli Clarke Pelli Architects Japan, Inc.
An essay by Jun Mitsui and "Park City Chuo-Minato the Tower, Park City Chuo-Minato the Residence", "LUMILACE TOYOSU", "Park City Kashiwano-ha Campus the Gate Tower", were published in KINDAIKENCHIKU Magazine for March 2016. 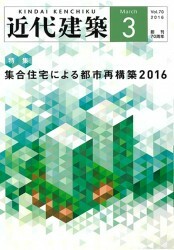 TOP News Publication An essay by Jun Mitsui and three projects were published in KINDAIKENCHIKU Magazine for March 2016.